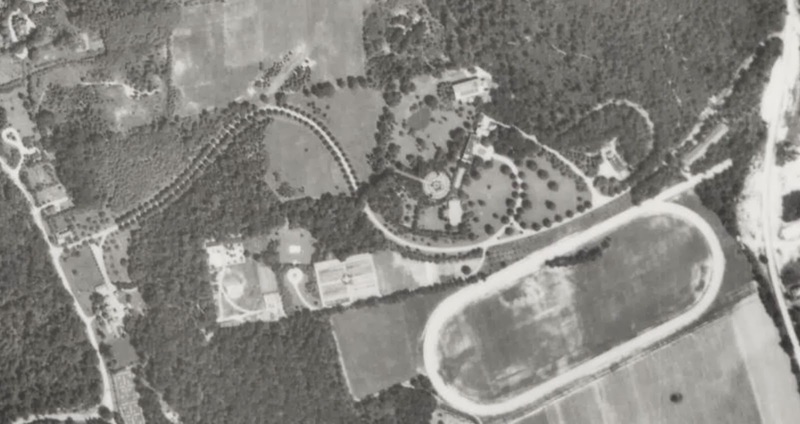 A 1938 aerial of 'Farlands', the Guernsey Curran estate designed by Guy Lowell c. 1918 in Upper Brookville. Click HERE and HERE for more on 'Farlands'. Photo from Stony Brook University's Digital Archive. Didn't realize they had a track as well as the large recreational playhouse which is still extant. I don't know how involved in racing Guernsey Curran was and suspect it was nil. Rather the next owner was a significant race horse owner and had the 5-furlong exercise track built. Farlands was purchased in 1936 by Josephine and Barclay Douglas, nee Hartford, granddaughter of George Huntington Hartford, founder A & P, who renamed it Mill River Farm and lived here for the next 20 years. Josephine, who died in 1992, was a fascinating woman. Four husbands (Douglas was #3) with her last husband being John Felix Cuneo Bryce. Although he used Ivar in lieu of John. Bryce was a Brit, Eton grad, spy, and close friend to Ian Flemming and was part of the character James Bond in real life. Although Ian only gave the nod to him by using Flex as the name for Bond's CIA friend. Ivar and Jo Hartford's estate on the Vermont border "Black Hole Hollow Farm" was featured in several James Bond books. Josephine also owned a breeding farm in Vermont called "Mill River Farm". Plus The Waves in Newport, RI, and an island known as Xanadu which Flemming also incorporated into his book "Dr No". Her best known horse was Miss Grillo, the winner of the Pimlico Cup in 1948.